Part Of The Best Of The Best For 2001! Both Inducted into the 2001 IKF Hall of Fame as San Shou's Best! 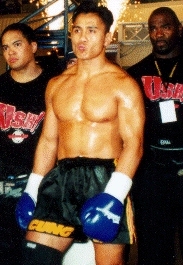 In the 2001, IKF Pro Fighters Of The Year Awards, San Shou Superstar and new IKF San Shou World Champion Cung Le, (Left & Right in Gold Trunks) of San Jose, CA, USA was selected. On December 15th, 2001 in San Jose California, USA, Le become the first IKF San Shou World Champion when he won the Light Heavyweight Title by unanimous decision over Shoni Carter of Chicago, Illinois, USA. In the bout, Le won on all 3 judges cards 5 rounds to 0 to be the first to capture an IKF San Shou World Title in the *ring. Carter proved to be one of Le's toughest opponents. Although he didn't have the throwing skills to match Le, his heart and toughness kept him strong throughout all 5 rounds. Great fight by both! (*) We say, first "In the ring" because in reality, someone else had an IKF World San Shou title before Le. The Semi Main Event that night lost some of it's hype when IKF MT & IR World Champion Danny Steele of Los Angeles, CA, USA didn't make the weight cut off of 147 lbs for the vacant IKF San Shou Welterweight World Title.Steele made 149.5 but was unable to drop any more as he was nursing a groin injury he had suffered about 4 weeks ago. Because of this, Matee Jedeepitak of Ratchaburi, Thailand via Indianapolis, Indiana, USA was awarded the World Title by forfeit. In the Amateur division, San Shou stand out Jenna Castilo (Left) of San Jose, CA, USA was selected into the IKF Hall of Fame in the Woman's San Shou Rules Division. On July 21st, 2001, San Jose, California, USA, Castilo defeated Katie Meehan of Denver Colorado, USA by TKO at 1:56 of round 2 to win the vacant IKF Amateur Woman's Bantamweight Title. In her first defense on December 15th, 2001 in San Jose, California, USA she defeated Christine Yandolli by Unanimous Decision 4 rounds to 0 on all 3 judges cards. Castilo's only problem is finding good "Experienced San Shou" competition in the woman's ranks. But even with top competition, we don't see her having much of a problem with other opponents. This Woman ROCKS! EXPLODES In San Jose, California, USA! While Jedeepitak, Ott, Madigan, Soto and Castillo All Win Their Title Bouts On "UNITED FOR THE CHILDREN" Event! A crowd of about 1,500 were treated to a great night of San Shou Style fighting which featured 12 San Shou fighters from East to West fighting for 6 IKF San Shou Titles. The Main event of the night featured the top ranked San Shou Fighter in the Nation, Cung Le (Left) San Jose, California, USA against top UFC competitor Shoni Carter (Right) of Chicago, Illinois, USA. This was a great bout that saw two warriors going at it toe to toe. Unlike some of Le's former opponents, Carter was much stronger and wasn't allowing Le any easy throws as we've seen in past bouts. Carter was strong in the clinch and had plenty of weapons from the outside as well. It was sure to be a true test of Le's fighting skills as well as Carters. NOTE: To respond to some of the fans comments about the IKF not having a belt to present to Castillo after her win, the reason was because her camp forgot to bring the Title Belt she was defending to the ring. This was not the fault of the IKF. The Main Event will feature San Shou Superstar Cung Le (Left) of San Jose, California, USA against Shoni Carter (Right) of Chicago, Illinois, USA. Le's, who's impressive career includes being a Light Heavyweight World Champion and Three Time Captain of the US National San Shou Team has been considered by many as one of the greatest fighters on the planet. On the other side of the ring will be UFC's #2 Ranked Middleweight and former Collegiate All-American Wrestler, Shonie "Showtime" Carter. The two will be fighting for the vacant IKF (International Kickboxing Federation) Light Heavyweight San Shou World Title. The other co-Main Event will be for the vacant IKF Pro San Shou Welterweight World title and will feature 2 Time IKF World Champion Danny Steele (Left) against #1 IKF Ranked Matee Jedeepitak (Right) of Indianapolis, Indiana, USA, via Ratchaburi, Thailand. Steele, who was Born in Saigon, Vietnam and raised in Hawaii currently lives in Los Angeles, California, USA and has a fight record of 37 wins with 9 loses and 2 draws with 28 of his wins coming by KO or TKO. He's obviously one of the best fighters on the planet with knockout power in both hands and leg kicks that could drop a tree. His skill has earned him a total of six world titles in five weight divisions and a nickname to go along with his proven toughness, Danny "Hard As" Steele! Before the two Pro World Title bouts will be a Pro Intercontinental Title between IKF Pro US San Shou Middleweight Champion Rudi Ott (Left) of San Jose California, USA against Peter Kaljevic (Right) who was born in Montenegro, Yugoslavia but currently resides in New York City, New York, USA. The event will also feature 2 US National Team members and IKF U.S. San Shou Champions, Santos Soto (IKF Amateur U.S. San Shou Super Welterweight Champion) and Jenna Castillo. (Right - IKF Amateur Woman's San Shou U. S. Bantamweight Champion. At only 19, Jenna Castillo will be defending her IKF US Amateur Title is already making her mark as one of the best young female fighters in the United States. Her strength in the ring center around her fierce competitiveness and her unflinching focus on her opponent. Castillo, (Right, 6-0, 5'5, 19) is a 1999 Pan American Game Competitor and member of the US National San Shou Team. She will face challenger Christine Yandolli (Left, 9-2, 5'7", 20) of Smithtown, Long Island, New York, USA has won an Amateur World Title, the USKBA North American Title, Tri-State Title, New York State Title and a Long Island title. San Francisco, CA -- December 3, 2001: D'Wayne Wiggins, (Right) top neo-soul/R&B vocalist, composer, arranger and producer, announced today he will be headlining the United for the Children half time show on Saturday, December 15, 2001 at the San Jose Event Center, San Jose, California. Benefiting the Marine Toys for Tots and the Twin Towers Orphan Fund, United for the Children will be a spectacular evening of live music, pyrotechnics, and world class martial arts as Cung Le challenges Shonie "Mr. International" Carter (Right) for the IKF World Title. This year, US Sanshou looks better than ever. The community is together for the promotion and growth of the Sanshou fights. We had many more Sanshou competitions held in this country from East coast to West coast. Many people have helped the growth of this Kungfu fights in the US, especially Jason Yee, Jash Bartholomew, Nick Scrima, Mike Altman, Scott Sheeley, John Wai, David Ross, Brent Hamby and Cung Le. US Open International 2001 had some of the best Sanshou fights on this land. We had not only top fighters from US, Egypt, Iran, Italy, Poland, Columbia, Mexico, Peru, etc but also B and C division fighters who gave us much needed new blood. There were 89 tournament fighters plus 5 super bouts at the US Open International 2001. China is set to host 2008 Olympics. We will have a great chance to be part of this game.. We need to be promote Kungfu-Wushu together to pave the way for that day to come, especially promote Sanshou in the US. China would very much like to put Sanshou/.Sanda on the Olympic world map. I firmly believe we will reach that goal. The World Wushu Championship is close, we are in the preparation for Armenia. The team had a great training camp in Mobile, Alabama. We will have two more training sessions. I would like to advise all our national team members and as well as other non- team fighters, especially A level fighters to join the following two training camps. San Jose Training Camp: This camp will be led by the Team Assistant Cung Le and team Captain Rudi Ott. It will be the first Week of September (1-8). Boston Training Camp: I will personally guide this training camp with Jason Yee who is one of the best trainer and coach for Sanshou in the US. This training camp will benefit fighters both national level and local level. Team Members: Ray Neves, Rudi Ott (Captain) Max Chen, Santo Sotos (substitute for Elan Schwarts) and Albert Pope. I just had a few days training with the 2nd US team which will be fighting in China. They had a great training. They all prepared to have a good fight in China. This is the first USA Sanshou Kungfu Federation contracted fighting series. We will train more fighters, certified coaches and judges to meet the demands in the Sanshou world which is growing so rapidly. Please keep up with our fighters in Shanghai, China. This Asian-televised fights will be watched by millions. Please visit www.ws.com.cn for fighting details. The following is the US vs China Sanshou Team. This is the 2nd US vs China semi pro fights after the Arts of War in Hawaii. We will cooperate with China to promote Sanshou in the US and world wide. Tim Shelton, Mike Altman (Captain), K.J. Noons, and Julio Trujillo. Rock The HOUSE In San Jose CA, USA! Sorry readers, but we we warned you.... If you wanted to see one of the Greatest San Shou Events Ever, you should have been at the West Valley College in San Jose, CA, USA last night, Saturday, July 21st! If you missed it, MAN! Did you miss it! "The Greatest Amateur San Shou Event in America!" World Famous San Shou fighter Cung Le and his staff from UsH Entertainment feature the BEST Amateur San Shou Fighters from across the USA! Le had some other World Famous stars in the house along with him on this night as well. In attendance was legendary martial arts star, Bob Wall (Left). For two decades Bob Wall was a force on the tournament circuit placing 1st or 2nd in every major karate championship from 1965 to 1972. He was also a member of the legendary quintet of Chuck Norris, Mike Stone, Joe Lewis, and Skipper Mullins sweeping the world professional titles for 1970, 71, & 72. In addition to his championship career in the ring, he was also the only actor to appear in three Bruce Lee movies. His most notable role was as the evil O'Hara (Right) in "Enter The Dragon," one of Warner Brothers top ten grossing films of all time. 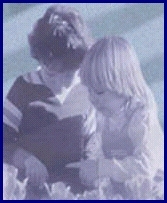 He and Lee were very close friends; they shared a special bond that lasted until Lee's untimely death. To this day Mr. Wall speaks often and fondly of his departed friend. for more on Mr. Wall, click HERE! Also in attendance was famous NHB Champion, Frank Shamrock (Right) and David Krapes of World Black Belt.com. The main excitement happened in the ring though on this night and here's a look at the results of the nights Amateur San Shou Championship Action! MAX CHEN (16-4, Cung Le, San Jose, CA, USA) defeated MATT CATELETA (4-2, Brent Hamby, EBM Kung-Fu Academy, Oakland, CA, USA) by unanimous decision. REY GARCIA (4-1, Reys Wing Chun Muay Thai, San Jose, CA, USA) defeated CODY FULLERTON (3-2, Scott Sheeley, Sheeley's Iron Tigers, Bellefontaine, Ohio, USA) by unanimous decision. JAMES COOPER (20-2/1, Houston Kickboxing, Houston, Texas, USA) defeated BRIAN MADIGAN (8-3/2, Brent Hamby, EBM Kung-Fu Academy, Oakland, CA, USA) by unanimous decision. KIMO RIGMADAN (8-2/2, Houston Kickboxing, Houston, Texas, USA) handed Champion *CHRIS OVERBEY (13-1-1/7, Scott Sheeley, Sheeley's Iron Tigers, Bellefontaine, Ohio, USA) his first loss by unanimous decision. SANTOS SOTO (10-2/4, Cung Le's USH! Fight Team, San Jose, CA, USA) defeated DOMINIC OLLHOFF (7-3/0, Scott Sheeley, Sheeley's Iron Tigers, Bellefontaine, Ohio, USA) by unanimous decision. ARMANDO RAMOS (Fairtex, San Francisco, CA, USA) was booked earlier in the week to face ALBERT POPE (13-0, Jason Ming Yee, Boston Sanshou Academy, Boston, MA, USA) Ramos had replaced ROBERT KING (Houston Kickboxing) who pulled out a couple weeks back. However, Ramos was a no show at the event after confirming he would be there for a specially scheduled late weigh-in. Since Ramos' no show was within 48 hours of the scheduled bout, Pope won the Title by forfeit. JENNA CASTILO (6-0, Cung Le's USH! Fight Team, San Jose, CA, USA) took advantage of KATIE MEEHAN's (4-2-1/1, 3-D Gym, Denver, Colorado, USA) lack of San Shou experience (First San Shou Bout) winning by TKO at 1:56 of round 2. Special Thank You to Katie though for filling in as an opponent for Castilo's former opponent who dropped out. LEE KING (7-0, Mike Altman, Houston, Texas, USA) defeated ALLAN EGGBURT (15-4/3, Scott Sheeley, Sheeley's Iron Tigers, Bellefontaine, Ohio, USA) by TKO when Referee Dan Stell stopped the bout at 1:54 of round 3. MARVIN PERRY (23-1/7, Jason Ming Yee, Boston Sanshou Academy, Boston, MA, USA) defeated ADAM CALDWELL (6-4, Brent Hamby, Oakland, CA, USA) by TKO at :26 seconds of the 3rd round. Perry impressed everyone with the tremendous power he had in both his front and rear round kicks that seemed to rock Caldwell through his own gloves. The sudden stop by referee Marcos Rosalas was questioned by the crowd but if you were watching Caldwell's eyes up close at ringside, you wouldn't have questioned it at all. An 8 count instead could have been an option for Rosalas but Perry's hand combinations that were set up by his thunderous kicks told the story. Not to mention the fact that Caldwell was taking several unanswered punches at the end. Caldwell had a strong showing throughout the bout, but on this day, Perry had the edge in the end. NIMA NOURI (Brent Hamby, Oakland, CA, USA) was awarded his title by forfeit when his opponent Adam Ronyn of Houston Kickboxing didn't make the weight for the title. Instead, both did a 2 round exhibition to start the night off. Lets don't forget the Special Exhibition by 2 Great Pro San Shou fighters. The nights star of course, Cung Le (Left) himself and his IKF Pro U.S. San Shou Champion student, Rudi Ott! The two thrilled the crowd with several dynamic San Shou throws mixed in with explosive kick and punch combinations in a quick but exciting 2 minute exhibition round. Great job in the youth Exhibition as well by Steffany Cornejo and Matt Dong of Cung Le's San Shou Club and of course, the Cung Le USH Demo Team. G-UP Energy Drink, World Black Belt.com, A-1 Fence, Oxy-Water, Discover Chiropractic, The Beauty Spot and Discoteca El Indito. For more info, please contact Mr. Cung Le and USH! ENTERTAINMENT at (408) 729-4900 or e-mail at CUNGLE@CUNGLE.COM. 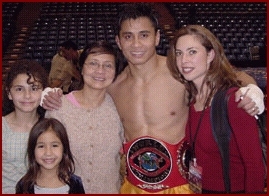 You can also check out the Cung Le web site at: CungLe.com. San Shou Shootout.. The Greatest San Shou Event Ever? If your in San Jose, CA, USA this Saturday night, July 21st, you might want to drop in to witness what could very well be"The Greatest Amateur San Shou Event in America!" World Famous San Shou fighter Cung Le (Left) and UsH Entertainment will feature the BEST Amateur San Shou Fighters in the USA to determine who truly is... "The BEST in the US!" LEE KING (Houston Kickboxing) vs. NIMA NOURI (TBA). Youth Exhibition: Steffany Cornejo VS Matt Dong. 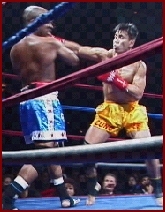 Special Exhibition: Cung Le VS Rudi Ott. The event will be held at the West Valley College in San Jose, California and will follow a daytime Tournament promoted by Le and his Promotional Team. For more info, please contact Mr. Cung Le and USH! ENTERTAINMENT at (408) 729-4900 or e-mail at CungLe@CungLe.COM. For more event info, you can also check out the Cung Le web site at: CungLe.com. After a discussion with San Shou Superstar Cung Le, the IKF has decided to drop the San Shou Division from the IKF/RINGSIDE National Amateur Tournament this September. Instead, the IKF and Cung Le are organizing a SEPARATE San Shou National Tournament that will be an Open Invitation Tournament. This event will be scheduled for sometime this fall. This decision won't surprise many since at last years 2000 IKF/RINGSIDE National Amateur Tournament there were only 3 fighters registered to fight in the San Shou Division. Super Heavyweight Edward Harrington of Drexel Hill, Pennsylvania, USA was registered to fight but didn't face any competition in his weight class so he switched to International Rules. In that division, Harrington defeated Terrance Meehan of Quantico, Virginia, USA by TKO at :57 seconds of round 3 in his opening round bout but lost to Kurt Hasley of Chattanooga, Tennessee, USA by TKO at 1:25 of round 1. Hasley went on to be the 2000 National Amateur Champion and also, later won the IKF North American Amateur Super Heavyweight Title over Canada's Keith Crawford. The other two San Shou fighters in the 2000 Tournament fought for the first ever, IKF National Amateur Tournament San Shou Title. In the Super Middleweight Division, Wayne Wilks, of Philadelphia, Pennsylvania, USA made history as he became the first ever to win an 2000 IKF/RINGSIDE National Amateur Tournament San Shou Title Bout. His victory came by an impressive HEAD KICK KO at :35 seconds of round 1 to Raymond Jenkins of Detroit, Michigan, USA. As of now, Le is organizing a MEGA IKF Amateur San Shou Event that will feature 10 IKF U.S. Amateur San Shou Titles. The event "BORN TO FIGHT" is planned for July 21st 2001 at the West Valley College in San Jose, California, USA. However, this will not be an open invitation tournament. Instead, Le will be putting together the best known San Shou fighters in the USA to fight for the many vacant IKF Amateur San Shou U.S. Titles to establish a stronger IKF Amateur San Shou Rankings. At the event, Martial Arts Superstars Frank Shamrock and Bob Wall of Enter the Dragon Fame, will be in attendance. How does Le know who's the best in the US? Keep in mind, were talking about a person who DOES know all the top San Shou Fighters and Trainers in the USA and many outside the USA as well. In addition, Le has also fought for years in the San Shou circuit as an amateur and a pro and better yet, he's won the titles to back up his knowledge of the sport. Knowing this, the IKF appointed Le to the position of IKF World San Shou Director. This position was formally held by Tat Mau Wong of San Francisco CA, USA several years ago. However Wong never took the San Shou Division to any higher level so the IKF retired his position after only 1 year at the helm. Wong also use to promote fights in San Francisco but he stopped promoting several years ago to pursue other interest. Le brings new light to the IKF San Shou Division. At this position, Le will help the IKF direct their Amateur San Shou division throughout the World and also assist with the IKF Pro San Shou Division. However, being a pro San Shou fighter himself, his work in the Pro San Division will be limited to avoid any conflict of interest. Why? As the three time Captain of the US National Team and pioneer of the Sanshou style of Martial Arts fighting in this country, for nearly 5 years I have fostered the dream of presenting the ultimate amateur Sanshou Fight Tournament. 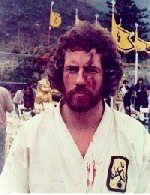 A tournament that was true to the practice of martial arts fight techniques. Where young martial artists from around the world who train in all fight styles would come together once a year to learn, grow and compete against the best amateur fighters. My dream of giving back to the sport and to nurture the growth of young martial artists is now a reality. On July 21st at West Valley College in San Jose, California the first annual "BORN TO FIGHT" Cung Le Sanshou Shootout will be held. The Sanshou Shootout will be divided into two segments. The Day Segment will be an open tournament sanctioned by the newly formed USA Sanshou Federation. To encourage the development of future champions there will be a Children's and Juniors Division, a beginners division (with no head contract), as well as intermediate and advanced Sanshou divisions. The Night Segment will be a grand event never seen before in the amateur ranks - we call it Super Fight Night. On this night many of our country's top amateur fighters will compete in the ring for National Titles. The fights will be sanctioned by the IKF (International Kickboxing Federation) and will be a treat for those who desire to see future world champions in action. To cap off the evening, I will give an exciting exhibition of world class Sanshou with this year's captain of the US National Team and current IKF Pro San Shou Middleweight Champion - Rudi Ott. If you are in the New York area you might have heard about an event called "Team USA vs. Team China" being billed as "the best US San Shou fighters vs. the Beijing Institute professional San Shou team". Many believe that this event, being a professional San Shou event, is being promoted by Steve Ventura and David A Ross. They not only run one of the largest San Shou programs in the country, having trained two current national San Shou champions, but they are also one of the top promoters of San Shou including professional San Shou. However, they are NOT involved in this event. And they want the fighting community to know this. This so called "Team USA vs. Team China" event is being promoted by a company called World Sport USA Inc., a promotion that not a single San Shou program in the United States has ever heard of before. The only thing that is accurate in their advertising so far has been that "Team China" is composed of the professional San Shou team from the Beijing Institute of Physical Culture. These five fighters are all professional, full time San Shou fighters and each have over 40 fights. They may in fact be China's best. So the obvious question is why aren't they facing the best US San Shou fighters? Until the next official, IWUF recognized, US team trials take place this May the only official "Team USA" is the team that went to the 5th World San Shou Championships in Hong Kong in November 1999. This team includes Cung Le (R- ISKA Pro San Shou Champion), Rudi Ott (IKF Pro San Shou Champion), Al Loriaux, Josh Bartholomew and Chinu Ly. Of these fighters, only Josh Bartholomew is reited, yet not a single one of these fighters is taking part in the World Sport USA event. Clearly, "Team USA" is NOT taking part in this event as advertised. In the United States, there are also a number of former amatuer San Shou champions who have turned professional. While they are not the official "Team USA" they are certainly members of the nation's best San Shou fighters fraternity. These fighters include Dan Garrett, Mike Altman, Scott Sheeley and Marvin Perry. However, none of these fighters are taking part in the event either! The event is taking place in New York City. New York City also happens to be the home of several professional fighters who, while their primary style is not San Shou, have indeed fought San Shou style and would be worthy opponents. Moti Horenstein is a professional Muay Thai fighter who also has excellent grappling skills. Peter Kaljivic has fought against members of the Chinese team in China before and has fought under shootboxing rules which are very similar to San Shou. Tom Battone is the USKBA world champion and has a San Shou background. Billy Maysonett is a Muay Thai fighter who has fought in several pro San Shou matches in NYC and is a well known fighter. However, none of these fighters in involved either. Finally, while the Beijing team is clearly professional, it has not been unheard of for amatuer fighters to face professional fighters in San Shou events. However, once again, the fact is that the nation's best amateurs are not taking part in the event either! The current national amateur champions include Ejovi Nuwere, Albert Pope, Robert Shultz, Robert Franshier, James Cooper, Adam Resnick, Marvin Perry (who won the amatuers a record 5 times and then turned pro) and Adam Caldwell. NONE are involved in the event. Who is on the team that World Sport USA is calling "Team USA"? Who are these fighters they are calling the best San Shou fighters? Apparently they are students of one of the promoters! In addition, they appear to be people who have never even fought in a San Shou event! So, don't let World Sport USA tell you that they are putting the nation's best San Shou fighters on their card. Don't support an event that so clearly thumbs their nose at both the fighters and the public.